Surprise Surprise, my new pattern Falling Leaves is a PIECED pattern. 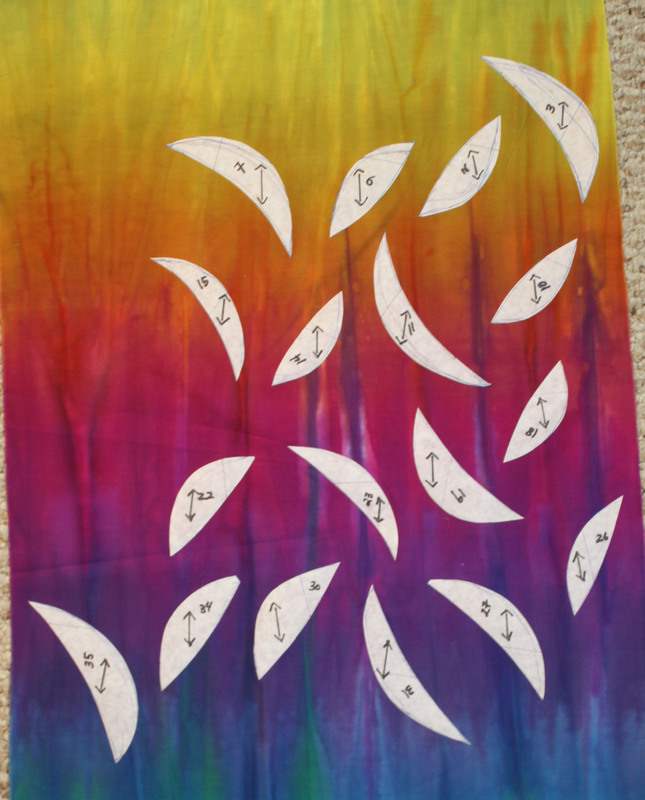 This is a new direction I am going with my quilting ideas. I have used an easy to apply, freezer paper technique, to create these designs, and I thought I would share the process with you. First thing I do is to copy the central part of this pattern to a piece of freezer paper using a black sharpie marker. I made the designs dark enough on the paper pattern that you can lay the freezer paper over the pattern and trace it out without using a light box. After I transfer the design I want to do a few things to the pattern before I cut it up and press the pieces to my fabric. I am going to write on each of the pattern pieces a number. This will help me when I go to reassemble the design. 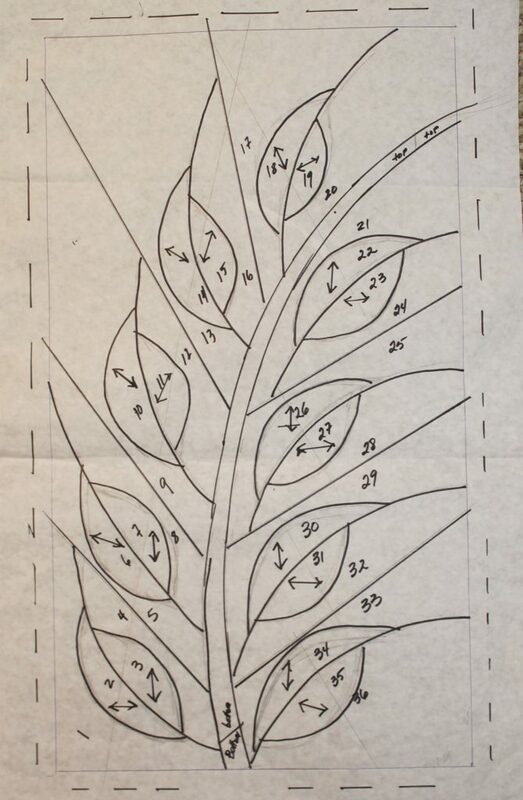 Next I will draw, with pencil, a line through each section of four pieces, like 1, 2, 3 and 4, a line that will be used as a reference when I go to put these back together once they are ironed onto the fabric, and I am going to mark with a 45° angle on each leaf shape to indicate how I want any stripe in the fabric to line up to create the illusion of veins in the leaves when I am done. THIS step is important!!!! Now I will cut this pattern apart using a rotary cutter and cutting directly on the black lines to give me 39 pattern pieces. I will place each of the background freezer paper pieces, numbers like 1 and 4, 5 and 8, etc shiny side down on to the backside of the fabric I am using for the background fabric. I will lightly press them to the fabric. Notice that I have spaced them about an inch about on the fabric. When I cut out these designs I want to have at least a 1/2″ seam allowance around each edge of the paper. If I use my 1″ x 6″ little acrylic ruler it’s easy to space them out. That way when I cut them out with my rotary cutter I can cut down the center of each piece and cut more efficiently. Because my Rainbow Stripe fabric has drip lines in it, I can utilize those “stripes” to give me the illusion of veins in my leaf shapes. 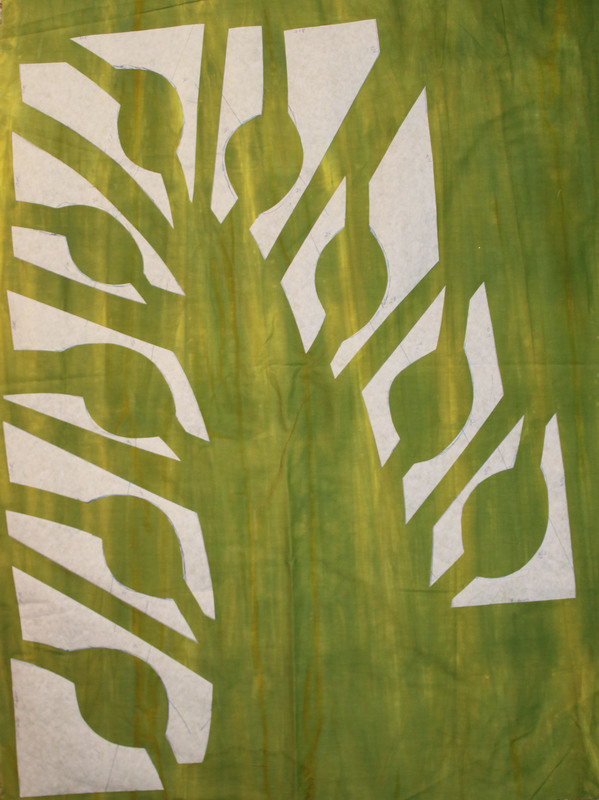 See how the arrows on the leaf sections of the pattern help me to place them to create that illusion of veins in the leaves. Again I want to make sure that I leave room to cut out each shape with at least a 1/2″ seam allowance. This 1/2″ seam allowance is going to help me when I sew all those curves pieces together. Enough for now, this is just the beginning of making this pattern. Check back for further steps. If you want to get started,get all this done and I’ll share some more soon.